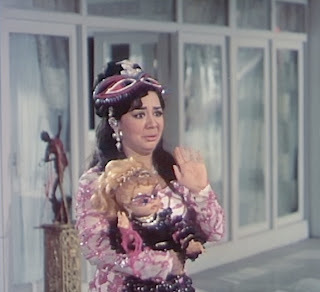 Like Seeta aur Geeta, Bobby was something I read about but thought I'd never get to see, as neither my local video store nor the Indian grocery store had it. But during a quick stop at the latter on Saturday, while looking over other shoppers' heads at the Hindi shelves, scanning for Shaadi se Pehle, which is mysteriously always out, lo and behold! Another classic and my education continues. I consider both of these finds auspicious, and I can't wait to find out what other older gems he has for me. 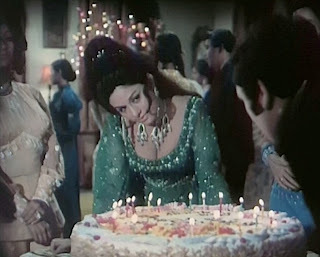 and there's a Mrs. Robinson-style seductress on the loose, who, according to my subtitles, was classy enough not to make a joke about Rishi and the what he's about to do to those candles. alongside more traditional values and behaviors, in her culture or any other. I'm not sure Bobby answered all of these questions, at least not clearly (kind of like how I wasn't sure what exactly Karan Johar was trying to say about infidelity and parenting in KANK). Bobby and Raja certainly caused a lot of trouble and heartache for the people who loved them, so maybe the point was that change is painful even when it's well-intentioned. And of course the story stops before the next immediate phase of their lives begins - he would go to university and she would go back to high school - and maybe the leisure of summer let their relationship bloom (or explode, depending on your point of view) the way it did. How would it fare in the more constrained and distracting world of school or work? We'll never know. Ordinarily I don't like endings that are the least bit unfinished, but maybe it's best to just leave them like that, holding hands with their fathers on a summer day, frozen at a giddy, happy, and dramatic stage of things. Update to post (January 7, 2007): prompted by thoughtful comments from the Buddha Smiled and in Filmi Geek's post on Bobby, I wanted to add in my questions about how this movie was received when it came out. Like Filmi Geek, I watched this movie out of its place in history, so when the Delhi-ite (that's not the right term, is it, but it will do for now) who runs the shop where I rented this started to tell me about how popular it had been and the astronomical ticket prices it commanded and how people bunked school to see it ("If someone was absent, the teacher did not even need to ask his friends where he was"), I asked him if it had been at all controversial. He looked surprised by my question and said not at all. But like TBS said, that seems unlikely to me, given the young age and religious differences of the couple - and especialy their disregard for their parents. Who else has thoughts to add? 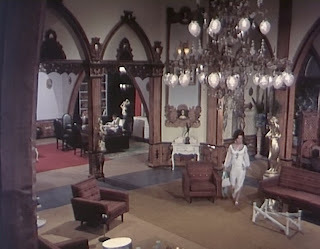 I can't think of what they are now, but I have seen at least two other films that used the same exact cavernous-room-with-staircase set that you posted two screenies of. 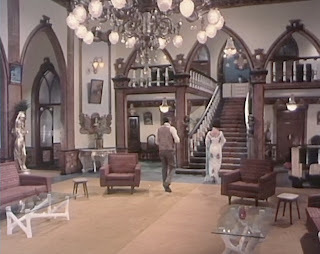 I think it just sat on some Bombay studio lot for half a decade and many ,many films were shot on it. If I stumble across the set again I'll come back and tell you which movie it was in. LOL, I can totally see Rishi and joey getting along fine. I love those staircases, they are like a warm blanket. If I didn't see them in a movie, I was suspicious to whether the people were really "Rich" or not. I just bought Bobby at Rhythm House in Mumbai. I can sing the entire song, so I knew I had to see the film. I could never find it in Austin, Texas. None of the local Indian grocery stores had it in stock. I hope to have time to watch it soon! Bobby was pretty radical for its time because of the whole caste/class/religion issue. 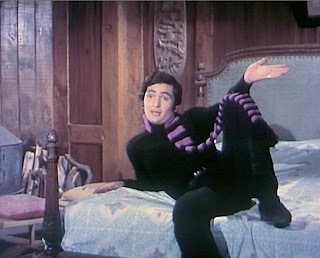 It's worth remembering that non-Hindus are untouchable in conservative terms, so for Rishi Kapoor to fall in love with one, let alone marry one, was a fairly strong message for the time. Beth, having now seen and reviewed this film I do think your review was more insightful than mine. 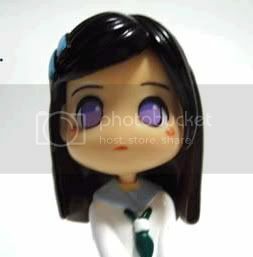 But your comment prodded some thoughts loose so I've responded on my my blog. Thanks! First it was HIT like you hadn't seen before; OK there were hits all the time, but this must have been the First Hindi film to generate spontaneous merchandising (Sandhna's cut = bangs notwithstanding): the bazaar was flooded with Bobby pins (decorative hair pins) still called like that, mothers were asked to and made Bobby hairdoes = two "ensaimadas (please google for photos)" on each side of your head, like some alien radars, Bobby skirts, Bobby blouses, Bobby what-nots, etc. etc. 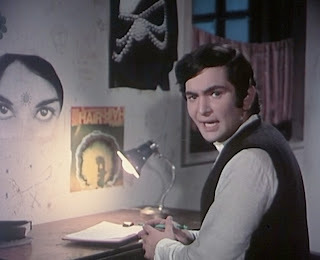 2: The first truly teenage Hindi film hero. 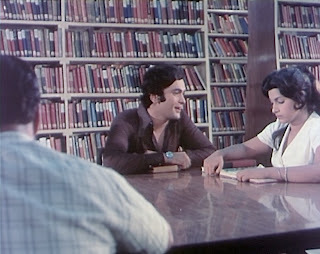 Before they had all been "Bhais", Rishi was actually a "Munda" as they would say in Punjabi, and thus all the teenagers, and others not so teenagey, went ga-ga over him. The music was brilliant, and was played to the point of no-return: every single song was a hit. 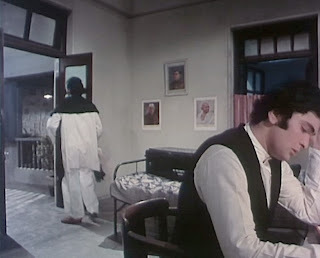 I don't remember all that high-low caste stuff being anything new, or talked about,it was just the usual story of so many Hindi films (the poster who says this was new, where had he been living?). 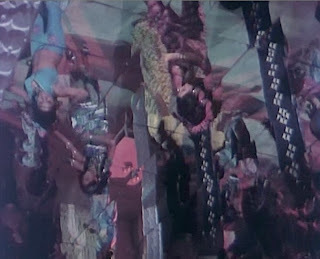 What I do remember that it just about escaped parent's censorship: if you just hear the number Hum Tum, that was very dangerous ground, although the comic picturisation took some of the effect away, very clever of RK. Some very very mini Dimple clothes, again far from what was conventionally decent wear for a heroine, but by making Bobby into a teenage girl, so perhaps still on the borderline of "frocks" age, RK again got away with it. Of course films afterwards all demanded it, and people like Neetu Singh etc. came up: for can you imagine Hema in one of those?